Calvin Flinn, 84, of Batesville passed away on June 8, 2018. He was born November 29, 1933 to Robert Lee and Nellie (Collins) Flinn. Calvin was a machinist and worked for McDonnell Douglas and White-Rodgers. He enjoyed fishing, gardening, traveling and spending time with his family. In addition to his parents, he is preceded in death by one son, Patrick Flinn, two brothers, Gary Flinn and Charles Flinn, five half-brothers, Monroe Flinn, Marlton Flinn, Marshall Flinn, Maloy Flinn, and Manco Flinn, three half-sisters, Maude Baker, Maymie Steadman, and Margaret Butano. 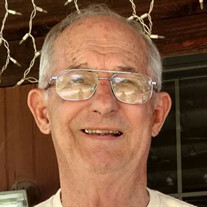 He is survived by his wife, Elorna Flinn of Batesville, one son, William Flinn of Batesville, two daughters, Ilene (Gary) Curtis of Cave City, AR, Sheila (Randell) Elumbaugh of Hutchinson, Mtn. AR, two sisters, Mary Cawly, and Doris Henke of Granite City, IL, six grandchildren, Justin Bell, David Monroe, Jake Bell, Summer Corona, Tommy Elumbaugh, and Shawna Curtis, twelve great-grandchildren, Ashtyn Bell, Ethan Bell, Ella Turner, Carter Turner, McKayla Acklin, Riley Acklin, Levi Bell, Gatlin Bell, Giovanni Corona, Antonio Corona, Sivle Curtis, and Xavier Carroll. A memorial service will be held on Friday, June 15 at 10 AM at the Willis Funeral Service Chapel. Burial will follow at the Oaklawn Cemetery in Batesville under the direction of Willis Funeral Service.